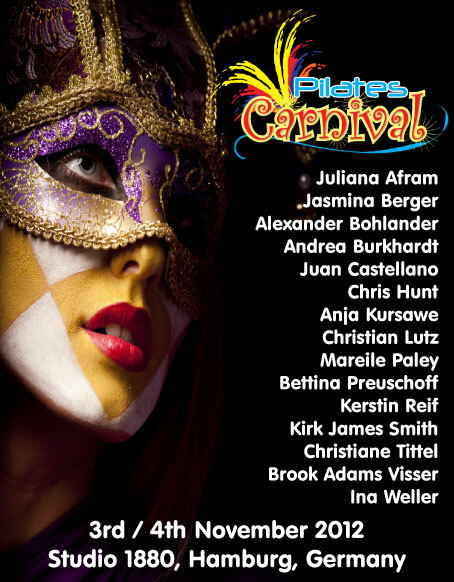 Pilates Carnival is a non-profit making organisation that has one simple aim: to promote and assist with the training of Pilates teachers all over the world. It does this by providing free places to training courses, conventions and workshops. Pilates Carnival organises a totally free Pilates convention for teachers of Pilates from all over the world no matter which school of Pilates they come from. The aim of the Pilates Carnival Convention is to enable Pilates teachers to teach, learn, socialise, break down barriers, and to share our passion and ideas. There are no fees, no egos, no boundaries, and no limits to what we can learn together. The next convention is on 3/4 November 2012 in Hamburg, Germany, and many of Germany’s top presenters will be there, as well as other presenters from USA, Spain, Poland and the UK. Next year the conventions are in Miami in April, Barcelona in October, and Munich in November. The convention offers a full program of classes, workshops and seminars including apparatus and mat classes. There are also plenty of opportunities to socialise with events including a dinner for all presenters and delegates. There are 70 places available for teachers to attend in Hamburg, and there will also be sessions for members of the public to experience tuition from some presenters that they might have only seen before on DVDs. There are teachers attending from Germany, Poland, Spain, England, India and Australia, and the 70 teacher places will be massively over- subscribed. The convention in Miami will be even bigger. The conventions are just the tip of the iceberg. Pilates Carnival has a growing global membership of teachers from all over the world so we can share ideas and improve training. In the rush for commercialism, people can forget what is important, so I am trying to give something back to the Pilates community, and I am thrilled that so many other people are willing to join me in this. As a free event, the challenge for me is to obtain sponsorship. Pilates Carnival will not make any profit as all monies received will cover the expenses of the conventions and improve the experience for those attending, and it will always be a free event for teachers to attend. A training system is only as good as the trainer who transports it. Therefore it is very important for us to train our trainers very personal. Our special io-Ball Training-team teaches the knowledge in an audible, practice-oriented and temperamental way. The trainings are one day trainings and therefore not expensive. Register yourself to one of the trainings, to be able to use the advantages of the new io-Ball training-concept. Due to the low purchase costs and the maximum of possibilities how to use the io-Ball, nothing speaks against using it in your studio. The trainings are for experienced trainers, mostly in the aerobic- and fitness area. The usefulness for all professionals in the areas of fitness, wellness and rehabilitation is huge. For courses, times and locations look at the right side. There you will also find information who organize them, an up to date information and how to book them. Lots of Success! The possibilities of two of the most important equipments for proprioceptive training are given – io-Ball and Staby – so they can be integrated optimally into the courses you offer. The Workshop is offered by SAFS&BETA Training Academy. Dates in 2009 will be available soon. Special training offers the new Cardio-Core interval-training with the io-Ball and is meant for Aerobic- and Fitness-trainer. Johanna Fellner and Doro Giera conduct the workshops, organized by rs-quality training. Our one day io-Ball Foundation basic training is meant for Aerobic- or Fitness-trainer. Johanna Fellner conducts those informative workshops organized by rs-quality training.